Thank you for giving us this interview today. 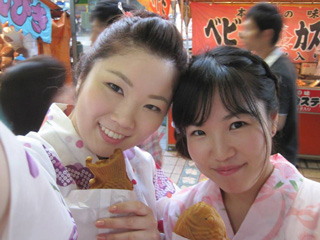 Why did you decide to come to Japan for study abroad? From the very beginning, I was very interested in Japanese culture. At that time I thought I would like to contribute to improving relations between Japan and Korea in the future. I thought that if I studied at a Japanese university, I would not just learn the language but also understand Japanese society better and so I decided to come to Japan. 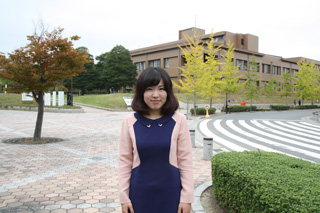 What is your reason for selecting Hiroshima University? 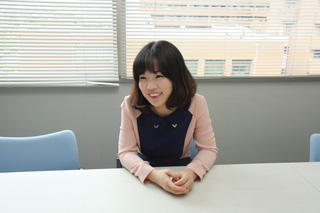 In order to study abroad at a national university, aside from the Examination for Japanese University Admission for International Students (EJU) one has to sit for TOEFL as the English language examination in most cases. Since I had only sat for TOEIC as the English exam, I searched for a university which accepted TOEIC. To be honest, I found Hiroshima University to be the best university from among all the universities that I could probably go to from the scores I had received in my TOEIC and EJU. In addition, I heard that Hiroshima University had comparatively fewer international students at the undergraduate level than other universities. I had wanted a university with few undergraduate international students from Korea all along. Thus I felt that Hiroshima University best suited me and so I decided to come to Hiroshima University. Was it difficult to prepare for the entrance examination? Yes. In Hiroshima University’s case, aside from EJU, one has to sit for either TOEIC or TOEFL and an oral interview examination. It was difficult in that I could not get the information on how to prepare for the oral interview. In the case of universities with many Korean students, one can find information on examinations or interviews through cram schools or the internet but why could I not find anything at all on Hiroshima University. I’m glad I was able to pass. Which province are you from in Korea? You came from that big city to quiet Saijo, didn’t you? Yes, at first I was surprised. When you say “Hiroshima”, I imagined Hiroshima City. Even during the time of my entrance exams, I stayed in a hotel in the city and I came to Hiroshima University by bus and for some reason, the bus kept heading deeper into the mountains. I was very nervous because I thought I had made a mistake and taken the wrong bus. After an hour passed and the bus arrived, I got out and looked around and this is where Saijo was (laughs). Yes, it was a beautiful dormitory that had just been built. Although it was unfortunate that I was not able to live there for more than a year, it was still good because it was cheap. I shop at the shopping center nearby. It’s fun shopping here because many of the goods that are sold in Japan are cute or ingenious and innovative. Are there certain products in Japan that would be good if these were available in Korea as well? I feel that Japan’s delivery service is really convenient. If you are not at home at the time of delivery, the delivery company not only provides the option of an alternative delivery date but can also let you designate a precise time, say, from 6 pm to 8 pm. In Korea I have barely seen such a service. You have to be at home the entire day until the luggage is delivered. “All-you-can-drink” options in Japanese-style pubs are also interesting. I have never seen that in Korea. As Korean people are heavy drinkers, it’s likely such a pub would go under (laughs). Do you do some things together with your friends or take part in circle activities? Unfortunately, I couldn’t participate enough in circle activities but I am basically an extrovert and have many good friends at university. For example, I made a lot of friends at the orientation camp, an event organized by the university for new students. Together we go drinking or go to places. When I joined the orientation camp as a second year student, there were 24 groups of 4-5 sophomores and 5-6 freshmen each, and I have served as the head of those groups. Wanting to do something memorable, I took the initiative to stand for elections. You also participated in the production of a DVD to introduce the university to foreign students. Was this your own initiative, too? No, it wasn’t. People asked me to do it and I accepted because I thought that I could be of help. I wish that not only post-graduates but also undergraduate students would know more about Hiroshima University and its good qualities. I see. By the way, is there a big difference between student’s life in Korea and Japan? Yes, there is. 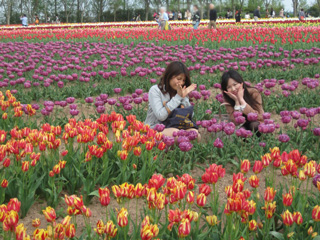 Many of my Japanese friends are working part-time and so I think that young Japanese people are quite independent. Also some Korean students work part-time but mostly as private tutors. Since other work does not pay very well, their parents tell them not to waste their time and to study instead. Is studying your first priority? Yes, that’s right. In Korea, if you do job hunting with the intention to get a good job, the environment is much severer than in Japan. In my country, everybody wants to enter a big company and the competition is fierce. Therefore in contrast to Japan, Korean students practically don’t graduate within four years. Many of them take a temporary leave from university and go study abroad or try to get certificates to make their resumes look good. I think that job hunting in Korea is tough for students. I see. How was it to study at the Faculty of Law? To tell the truth, I was more interested in politics than law. Once I entered university, there were mainly lectures on law such as civic and criminal laws and so it was difficult for me to keep up with the class. Honestly, I couldn’t afford to have fun and just tried hard to memorize the contents of textbooks and academic books. Yes, it was. My Japanese teachers in Korea spoke very carefully and so they were easy to understand. In Japan, my teachers hold the lectures in dialects and so-called “natural” Japanese, and so sometimes I couldn’t catch what they said. When I came to Japan, at the beginning I’ve used formal words like “shikashi” (however) or “soshite” (and then) even in spoken language, just as I had learned it from my Japanese textbook in Korea. 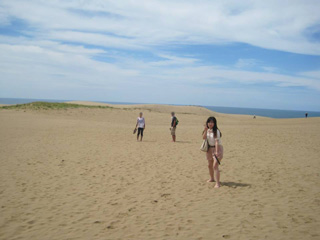 Then I gradually abandoned that and my language became much more natural. I heard that you will work at a Japanese company next year. Yes, I will. I wished to make use of my experiences in Japan and my Japanese language ability. At present, I’m receiving a scholarship from a Japanese company. I want to contribute to a Japanese company in return for the help I have got. When I did job hunting it was my wish to work at a socially influential enterprise such as a bank or a communication enterprise. Luckily, I got an unofficial job offer from a Japanese telecommunications company. What are your impressions about job hunting? It was very hard for me, when I had to fill out an entry sheet and to study for the exams before the job interview. 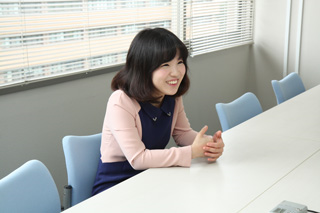 The job interview itself was not so difficult for me because I like to speak to people a lot. The only difficult aspect was the usage of “sasete itadakimasu” (to have the privilege of doing) and other specific Japanese honorific expressions which don’t exist in Korean. 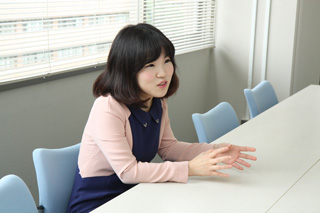 But when you are job hunting, you have to know that Japanese companies are strict about personal appearance. You have to wear a suit with 2 buttons and use a bag that does not fall over when you put it on the floor (laughs). Now, job hunting is over. What do you wish mostly to do now? I want to enjoy myself (laughs). Still, I want to learn English. Also I want to get the necessary qualifications for working at a telecommunications company. There are so many things I want to do. You’re right. By the way, is there any advice you can give to students who plan to study abroad? When you wish to study abroad you have to gather courage and put ideas into action. Furthermore, I wish that once you leave your country, whatever happens you should never give up and stick it out. Among my friends and juniors there are some who are disappointed and say that in reality Japan was different to that what they had expected and others who want to return to Korea. When you study abroad you never can expect a perfect student life. Future international students have to know that challenges are never without setbacks. For example, when you meet an obstacle, it is important that you don’t give up and try to keep your mental balance. I also recommend making a concrete plan about what you want to study before you go abroad. I entered the Faculty of Law with the intention to study Politics, turned out that there were mainly lectures on law and so it was very difficult for me to follow the lectures. Of course, there were many things I learned, but all the same, I wish that my juniors will have it easier than me. I wish to implement my own idea to develop a new kind of service and to promote Japanese provincial areas such as Hiroshima and the whole of West Japan. That’s my dream. Actually, I was active as a member of the “Charm of Hiroshima”. Together with the people from prefecture and other organizations I helped to create pamphlets and the homepage with the purpose of conveying our message about the charm of Hiroshima to the world. I’m so grateful for the help and kindness of the people of this prefecture, and I would like to return the favor. What’s the first you want to do after entering the company? As I told you before, I wish to work for the development of services. You may wonder why a liberal arts student is interested in service development but arts students can deal with development as well. By the way, this department will be a place where I can develop new products for telecommunications by my own idea. So I want to launch an idea that helps to regenerate the provinces. Well then, can you give us a final and comprehensive comment about your student life up until now? I’m really happy that I came to Hiroshima. My friends who are studying in big cities such as Tokyo say that they are very proud of their universities, but it seems they cannot feel as much love for the province of their alma mater. 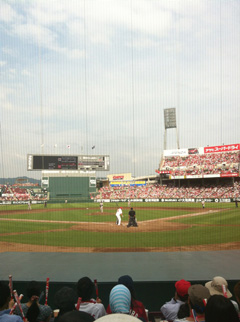 However, I feel that Hiroshima is my second hometown. When I enter the workforce, my first placement might be at a place far away from the town I have lived and my home university but I shall try my best nonetheless, to repay the Hiroshima people for their kindness. Someday, I’ll definitely contribute to the development of Hiroshima!